The thing is: I like working in jails. I was never unhappy as an ER physician. But I get more overall satisfaction out of my work in jails and prisons. This column will be my forum to tell you why. What do you think of the MedPage Today post? Please comment! Love this post. I don’t think many of us back in our college years taking classes to become a physician or nurse practitioner thought to ourselves..”Someday I hope to work in a jail!”. I know that was definitely not the case for me. I have been working as a nurse practitioner at a county jail (which currently holds 800 males and 100 females as of todays count) for the past six years. I have seen more than I dreamed off (or wished I’d seen)…and just when I think I have seen it all, someone out there still finds a way to surprise me. It’s frustrating ,exciting, challenging and rewarding all occurring on a daily basis for me. I can honestly say though I really love what I’m doing. As a side note…is anyone dealing with inmates who have smoked the synthetic marijuana laced with rat poisoning causing severe coagulopathy? We have been getting several inmates who have experienced this. The treatment is high dose Vit K1 (Phytondione), usually 25-50mg up to TID until therapeutic INR is reached, then slowly titrate the dose down. This can take up to several weeks or even months. The challenges I am having right now are 1). People who are non-compliant prior to coming to jail or were managed at the jail then left and came back and were non-compliant with treatment (and smoked K2 again) 2). The medication is extremely expensive. Our pharmacy is quoting approximately $1600 for 30 pills (5mg). I have one patient receiving 50 mg twice daily right now which comes out to roughly $1000 per day! Just wondering if anyone else has treated any cases of this and how you are managing. I live in Illinois and I believe this a more isolated issue right now, but with all things it will likely spread to other areas or be something we will all be dealing with at some point. I respect this. Health care in this country is set up so only the rich can afford it. The medical field is a profit focused industry. 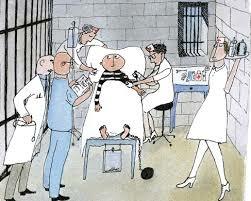 It’s sad that the poor can only get the medical help they need once they are in prison. Imagine all the law abiding poor who never get treatment for their health issues.